Robo-advisors are platforms that use algorithms to manage users’ investment platforms. And they are threatening to upend the enormous global wealth management industry. Globally, wealth managers were responsible for $74 trillion in assets under management (AUM) in 2014. BI Intelligence forecasts that robo-advisors will manage around 10% of total global assets under management (AUM) by 2020. This equates to around $8 trillion. advisors can succeed as massive legacy companies begin offering their own services. Large incumbent wealth managers won’t lose out to startups like Betterment and Wealthfront. Instead, they are embracing the technology and launching their own products, which are scaling quickly. 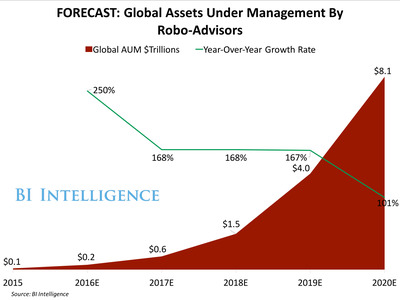 The majority of assets managed by robo-advisors will come from people who already have some investments. We estimate that the volume of assets that comes from people who don’t currently invest will be less than 1% of the total by 2020. Startups are going to find it difficult to scale, and will need to differentiate their products to succeed. They are already doing this by providing white label services to wealth managers, and more customised stand alone solutions.